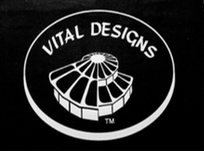 Vital Designs has been key in designing and installing many villages and commercial developments such as schools, retreats, church camps, ashrams, healing centers and plan developments worldwide for over 4 decades, David Raitt, now in his early 60’s, along with his associate contractors, engineers, draftsman designers are all in their prime and have the experience and are eager to facilitate more projects. The following 20 projects will give you an idea of the wide range of designs and scope of development services we provide. We designed and installed a 31’ yurt with wings to replace a 30’ fabric yurt for seminar space as well as 6 other work scholar and staff housing units, Some with kitchens and bathrooms. All this we did over 2 decades in phases. We even flew one yurt from a Monarch nesting area to a safer location with a crane. “UP YURTS” some of the units have sod roofs. Glen Echo Park Glen Echo Washington D.C.
Over 40 years ago I was under contract with the National Park Service through the Interior Department to build my 3rd Yurt Village for the American Crafts Council. Now decades later the Glen Echo Pottery, as well as the crafts village sod covered yurts, are still in use for the adult education program as part of the National Park program. Featured in the Washington Post. I originally owned this property and built 6 41’ Yurt towers as 3 and 4 bedroom homes with garages under. We subdivided into 3 parcels and sold them when completed. This Village was made earth friendly and are super insulated with ceramic coated Class A siding and Class A fireproof roofing. Now 30 years later and performing well, this project sits across Highway 101 form the Real Goods Solar Living Center and is the first of such developments built in a 100-year flood zone. The main floor is 12” above the 100-year flood level requiring boat access to the deck entries with breakaway vent flow through garages under. After the San Diego fires several years back this triplex was built to the new Urban Wildlife standards. For a central staff room and a duplex staff housing unit. We installed cupolas and fireproof siding and roofing. Our Partners, The Gaulburn Yurtworks in Australia built these playrooms at two N.S.W. locations, one in Sydney for the McDonald’s food chain. Plumfield Children’s Academy Sebastopol, Ca. The Plumfield Children’s Academy hired our design and contractors and architect to build over 2 phases over 10 years. We built a large portion of the campus in Occidental California. A farm like setting, where foster kids can get a Waldorf education. We built a 36’ music room where the famous Plumfield Academy drum core practices. This room had to sustain an under 55-decibel noise limit with a marching drum band insulate their sound so the neighbors 55’ away could not hear them. 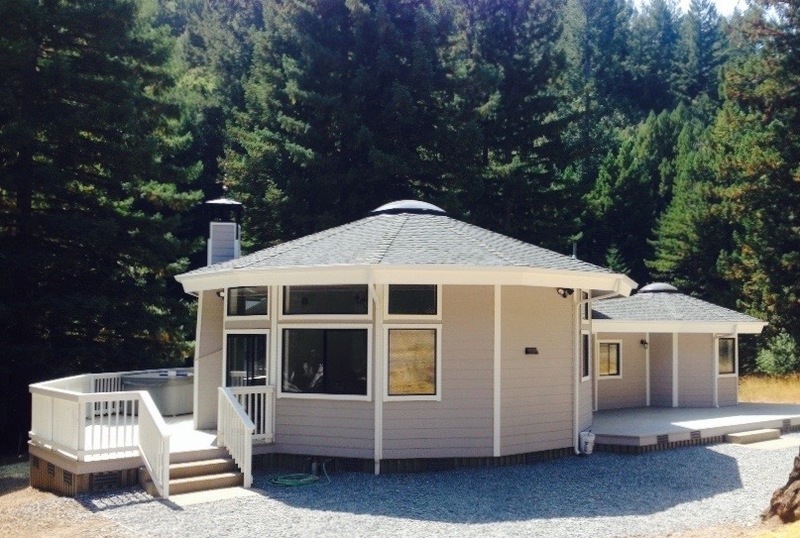 The Orr Springs “Fern Village” has 5 - 16‘ yurts with hardwood stair access up the side of a hill where Hot Springs guests can enjoy a retreat bedroom and deck in the ferns and redwoods. There is a central bath and shower and laundry center with a self-contained septic system that purifies the water. We have a phased plan in place to build a new massage room and Nautilus office above the springs with handicap access planned for when funds are available. John Jeavon’s Bio-Intensive Research Center educates and teaches farming practices that train how to grow organic food on half of the land with twice the output than conventional crop systems. This complex of 3 yurts both houses the students and provides a central 31’ open seminar dining and gathering area with a large root cellar and kitchen and laundry compost toilets. All built to the Urban Wildfire codes. Tempered windows, fireproof exteriors and roofing, Steel /concrete decking and rails and reclaimed hardwood floors. This meditation retreat is located far into the hills in Redwood Valley and has 5 of our nomad series yurts with bamboo flooring and central compost toilets. Bamboo floors and individual 50’ meditation walkways where monks can live and meditate and bow/walk pray each day and sleep for several weeks isolated from any contact other than a modest food delivery daily. We had to carry in the yurts on trails installed often on steep terrain with Geo-Tech engineered foundations. We installed propane flex and water lines with solar power for year-round use at times on steep terrain. This meditation retreat is located far into the hills in Redwood Valley and had 5 of our nomad series Yurts with Bamboo Flooring and Central compost toilets, Bamboo floors and individual 50’ meditation walkways where Monks can live and meditate and bow/Walk pray each day and sleep for several weeks isolated from any contract other than a modest food delivery daily. We had to carry in the yurts on trails installed often on steep terrain with Geo-Tech engineered foundations. We installed propane flex and water lined with solar power for year-round use at times on steep terrain. The Turoa Yurt Development owned by the Gibson Brothers. Vital Designs licenses this 20 unit development in Owakuni New Zealand. We were hired to train and set up a manufacturing facility in an old auto garage. This unit is now in its 3rd of 6 development phases over 20 years. They sell 2 and three bedroom vacation homes for skiers at the base of Mt. Ruapao “The Giant” ski resort which is a semi-active Volcano. This 19 unit development that has been approved and is shovel ready awaiting investment. This is an in-house medium high-end eco-housing development. Yurt style, sustainable and solar powered grid tie with reclaimed water for landscaping, solar hot water built with sustainable green materials. We replaced an illegal 30’ fabric yurt with a 31’ California code fireproof meditation hall. See the future phase proposal elevation of the next meditation center and home and library to be built when funding is available. We built over a 10 year period a ranch development. Two homes along the Russian River. For one twin yurt home cluster, we incorporated an earth cooling system that pulls passively cool air from the river through a tube with a mister. The other tower home we installed a lifetime comp. roof and replaced the shingles we originally installed 30 years earlier. The Family Villa in Pescaderro Mexico was started over 10 years ago and as the family grows so does the Villa. The plan below shows all the future phases which are planned to be completed over the next 5 years. The Rocky Creek Retreat was built as part of a living trust for the parents and the two kids families so they could vacation either separately or together sharing the common kitchen dining living yurt with day bed. The parents have their own kitchen and bath multi-room with fold down queen bed. The two children’s families have a twin expanded yurt duplex with each having their own bedroom and bathroom with a removable partition in the central interconnect for when both families kids are there all at once. They can partition off however and when they are there individually.